Meatloaf was one of the few meals with meat that I really liked as a young child (apart from Wiener sausage). My mother used to make a big portion of it which we ate cold the following days. I still prefer it that way! When we were younger, my sister and I weren’t very experimental when it came to our food, that changed over the years and it effected my mother’s cooking. 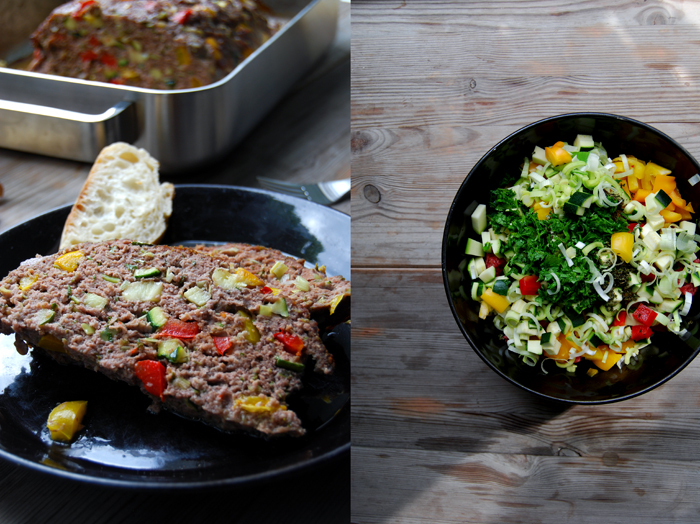 Now she fills her meatloaf with vegetables and herbs, a Mediterranean version but in those days she kept it simple to please our sensitive taste buds and picky taste. I hadn’t made meatloaf for years, I had forgotten about it to be honest, but two summers ago my mother cooked it for a garden party. My whole family (which is quite big) was there, it was a hot day in July and no one wanted to stay inside the house. We just went to the kitchen to fill our plates at the long table piled with lots of summery dishes and then went straight outside again to sit on the grass. It was a big picnic, a beautiful day with eating, drinking, laughing and playing music – and the cold meat was my happy rediscovery! 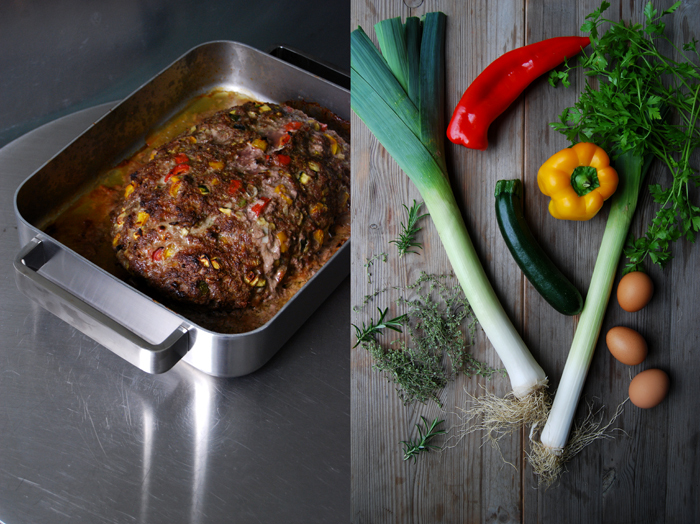 This meatloaf is very juicy, it’s cooked with zucchini, leek, bell pepper and lots of herbs. Thyme, oregano and rosemary give it a Mediterranean touch, either warm or cold, it’s best with a light salad and some baguette on the side. Set the oven to 170°C / 340°F (I used the Rotitherm setting but you could also use fan). Mix the milk and breadcrumbs. In a large bowl mix the other ingredients, add the milk and combine well with your hands or a mixer. Put the mixture in a baking dish and form a loaf. Bake in the oven for 45 minutes or until golden brown. 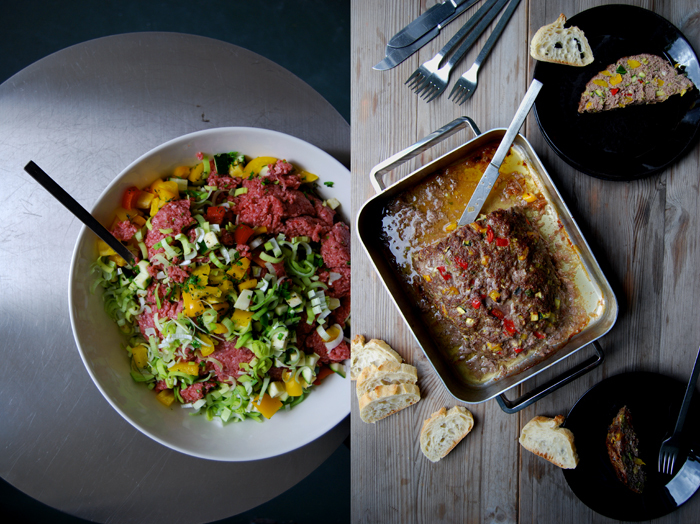 Serve warm or cold, the meatloaf is great for summer parties and picnics! This is a gorgeous looking meatloaf!! Lovely looking, with all the vegetables and herbs. I love meatloaf sandwiches the next day.